After the Louisiana Purchase in 1803 and the Lewis and Clark expedition in 1804-1806, expansion into the “Far West” of the continental United States began in earnest. Fur trade with the natives, particularly for beaver pelts grew rapidly to meet the needs of the fashionable eastern U. S. and European hat markets. Early traders made valuable contacts with native inhabitants of the area. Businessmen formed companies and built trading forts along major waterways. Some of these early fur companies were the St. Louis Missouri Fur Company, the Rocky Mountain Fur Company and in the north, the Hudson’s Bay Company. Traders established close relationships with the American Indian tribes and relied heavily on these relationships to obtain immense numbers of beaver pelts. Independent “mountain men” and eventually “company men” joined the native trappers. Prearranged “rendezvous” were held for the trappers to meet once a year to trade their pelts for supplies, thereby eliminating the need for them to return to the settlements. The beaver population declined sharply, fashion turned to silk in the hat industry and the final rendezvous was held in 1840. 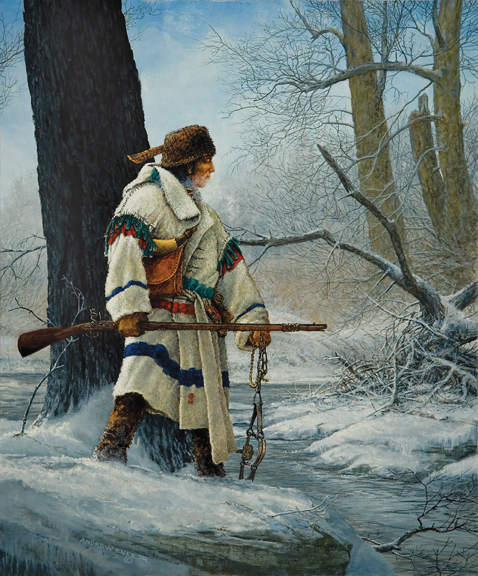 The Crow trapper in this painting, wrapped in his four-point blanket capote scans a stream for a good place to set the final trap on his trapline. Harsh elements, predators and the threat of thieves required constant vigilance and a bit of good luck for the trapper to survive and hopefully prosper through another winter.